Orton: the musical – What part did Kenneth Halliwell play in Joe Orton’s Success? Joe Orton’s contribution to British culture is well-documented. Kenneth Halliwell’s isn’t. Halliwell isn’t remembered for his art, and when it is mentioned it is dismissed as illicit collage, the stealing of library books. Orton is remembered for his plays Entertaining Mr Sloane, Loot and What the Butler Saw, and also his candid diaries. But how much influence was his lover Kenneth Halliwell on his work? Was Halliwell given the credit he deserved? Was the tragedy of their lives dictated simply by jealousy? Was Halliwell merely a mentor and teacher or was his contribution to Orton’s plays something greater? Written by Richard Silver and Sean J Hume, the new musical Orton, on now at Above the Stag looks at the relationship between the two would-be actors turned writers. Directed by Tim McArthur it is an enjoyable song and dance whirl through the RADA-to-death trajectory of Orton and Halliwell’s lives. With amusing dances and rhymes it entertains but makes you question whether Halliwell was mistreated by Orton and society. Oh and by the way Above the Stag isn’t Above the Stag at all, not since the Stag was bulldozed in 2012. It’s now in a railway arch in Vauxhall. As you might imagine I didn’t meet Joe Orton before his demise. But from the photos, films and reports of the British playwright it seems Richard Dawes makes an ideal Joe. He has the looks and the cheeky charm that captivated high society figures back in the Sixties. Andrew Rowney plays Halliwell as an uptight neurotic, unable to enjoy himself at parties, constantly questioning and unable to live in the moment – as Joe so clearly manages. Together they make a believable couple who sink into a marital stupor worthy of any heterosexual couple. The two men met at RADA in 1951, when Halliwell was 25 and Orton 18. Orton’s naïveté lasts one song and he is always depicted as the stronger character in the relationship. Within a month he had moved into Halliwell’s flat. They were lovers until their deaths, although Orton was promiscuous and unable to remain monogamous as Halliwell would have preferred. The inventive set is painted to look like pages from Orton’s diaries. Full marks to designer Andrew Holton who has created a sliding backdrop that allows quick changes between the small collaged flat and offices, parties and even an atmospherically dripping public lavatory. As in Orton’s life so in the musical – the best parts are for men. Simon Kingsley pulls off an excellent Kenneth Williams, and the writers have given him some choice lines that sound perfectly Kenneth. Robert McNeilly is a natural comic, even managing to make changing the scene to a Moroccan villa seem amusing. Prison – an absurd six months for defacing library books – was the experience that changed Joe and Kenneth’s relationship dynamic. Halliwell was crushed, whilst Orton thrived on the experience. It gave him a focus and a target for his writing. Orton suggests that Halliwell was a crushed man even before the incarceration, and the experience, combined with the success of Joe, and the lack of credit for his input helped push him over the edge. The fact that this new musical is called Orton, rather than Orton and Halliwell shows that Halliwell’s fears of being side-lined were not misplaced. If almost fifty years after their deaths Orton is still the poster-boy that brings in the crowds, it is easy to see how neglected Halliwell must have felt back in the 60s. 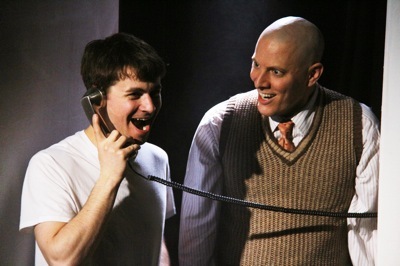 The musical gives no new answers, but Orton’s refusal to refer to Halliwell as anything more than his flatmate and friend or to credit him for his work are shown to be factors in their tragic lives. You’re not really famous until a musical has been made about your life. Halliwell’s name might not be in the title, but he is a large part of Orton. Does that reflect his behind-the-scenes role in the writing of Orton’s plays?